Kitchen finishes are the soul of your kitchen, so make sure you get exactly what you’re looking for. Now that you’ve decided on the style of kitchen you’ve always longed for, the next step is to choose the finishes for the new favourite room in your family home. 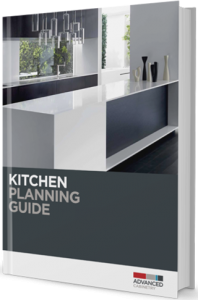 While each of the steps in the kitchen design process require purposeful planning and thoughtful consideration, it is this step—the kitchen finishes—that often seems more complicated and challenging than the others. Embracing the experience and recommendations of a kitchen design consultant when choosing your materials palette will eliminate a lot of stress and help keep the experience enjoyable. While kitchen finishes can include everything from the colour and material of a splashback, to lighting, fixtures, and hardware, there are two areas that should be decided upon first. Benchtops are often one of the first features noticed in a new kitchen. The benchtops embracing the cooktop, the sink and the room’s large island are the biggest items displaying your texture and colour choices. Benchtops can be made of laminate, natural stone, composite materials, stainless steel or natural timber. When choosing the finish for this feature, careful consideration needs to be given to how the frequently-used benchtops will be cleaned and maintained. In addition to choosing the finishes for your benchtops, another big item in your kitchen is your cabinetry. Many finishes are available such as melamine, vinyl, timber and 2pak. Available in as many colours and styles as your benchtops, consideration needs to be given to how the frequently-used cabinetry will be cleaned and maintained. Choosing the most durable, carefully-crafted and high-quality cabinetry requires choosing the most experienced, professional and skilled designers and cabinetmakers. Don’t settle for second best when it comes to your cabinetry. Choose finishes that clearly reflect your style and your design preferences. Like the kitchen’s island, where family and friends will gather, and the benchtops where cold food is prepped and hot food is placed, the kitchen’s cabinetry will be accessed and used countless times by countless people throughout the years. Download your free kitchen planner, fill out the details and then book an appointment.